Ocular surface irregularities (epithelial nodules, epithelial irregularity or dystrophy) can cause foreign body sensation, tearing and soreness. These symptoms can cause discomfort or even poor quality of life. Main complaint is usually derived from recurrent erosion syndrome (RCE) that can cause severe pain when awakening up and opening eyes first time in the morning. Other conditions as Salzmann nodular degeneration can cause similar complaints. Patients seeking for relief treatment usually have enough with ocular lubricants (artificial tears, lubricant ointments). When pain episodes are frequent, interventional measures are indicated. Alcohol delamination of the corneal epithelium has shown to be an effective and safe treatment. We show our protocol to treat these symptomatic epithelial diseases. Retrospective, non-randomized, interventional case series at Admiravision in Barcelona, Spain. The ethical principles outlined in the Declaration of Helsinki (2008) were adhered to in carrying out this study. Informed consent for intervention and records review was obtained for this retrospective study. Records of patients who underwent alcohol delamination between November 2015 and December 2017 were reviewed. Gender, age, pain score and number of episodes per year (Table 1), epithelium mobility detected at slit lamp, intervention, need of more interventions, complications and outcomes were registered. Inclusion criteria is resumed in Table 2. Under topical anaesthesia 20% alcohol was applied on the cornea with the use of a well for 40 seconds. The cornea was then rinsed with sterile balanced salt solution and the epithelium was debrided. A bandage contact lens (BCL) was put in at the end and patients had postoperatively ofloxacin 0.3% eye drops, artificial tears and oral analgesia. Success was defined as complete resolution of symptoms for at least one month, as found in literature [1,2]. We defined continued success as complete resolution of symptoms (using only lubricants) for at least one year. A total of 10 eyes of 10 patients were included. The mean age at the time of the first alcohol delamination was 38.8 years (range 27-57), with predominance of females (70%) and right eyes (60%). 30% patients had severity grade 4, 60% grade 3 and 10% grade 2. Patients were followed for an average time of 20.3 ± 7.3 months. Indications were recurrent corneal erosion from different origins (90%) and Salzmann nodules (10%). One patient with recurrent corneal erosion had previously anterior stromal puncture without any improvement 5 months before alcohol delamination (Table 3). All patients achieved success. However, continued success was achieved in only 70% of them. One of them had not enough follow up to apply this definition (follow up of 11 months so far). The other two (with recurrent corneal erosion) had relapses of soreness before a year. One of them had a new alcohol delamination of the epithelium 7 months after the first one. After 11 months being asymptomatic, new episodes of sudden onset of pain during night or upon awakening turned up weekly. Initially those were managed with bandage contact lens, but after 6 months and new episodes despite BCL a phototherapeutic keratectomy was decided. After 3 months, the patient had no new episodes and a slight myopia (-0.25D). The other was asymptomatic for 3 months and then started to have episodes of soreness every 6-8 weeks. After intensive lubrication for 10 months with no improvement, treatment with plasma rich in growth factors eye drops (Endoret system; BTI Biotechnology Institute, S.L., Miñano, Álava, Spain) was started. After six months the patient reported no symptoms. The patient with previous Salzmann nodular degeneration was asymptomatic after 21 months with no recurrence of the nodule. No postoperative complications (keratitis, postoperative haze and loss of visual acuity) were found. Only in the patient with Salzmann nodular degeneration, a small leucoma could be found after intervention (Figure 1). In 2006, Dua, et al. described alcohol delamination as a novel treatment for recurrent corneal erosion . Theorical advantages over phototherapeutic keratectomy (PTK) are a small learning curvature, no need of laser machines and cost-effectiveness . Main problem of alcohol delamination is pain, especially for the first 48-72 h, that can be managed with oral analgesia and benzodiazepine for few days. Randomized trials comparing both techniques showed no statistical differences in success rate between techniques (65% alcohol delamination vs. 63% PTK) . In our study, success rates, low rate of complications, mean age and gender were consistent with the literature [1,2,4]. However, definition of success used in literature could be insufficient. Our study showed relapses in long term follow up, demonstrating need of longer follow up and the need to redefine the success term in that pathology. Our protocol is aimed to manage symptomatic corneal irregularity, especially recurrent corneal erosion after blunt trauma, once they become clinically significant. Several studies have tried to find best prophylactic treatment for blunt and superficial corneal trauma in order to avoid recurrent corneal erosion. Recently a Cochrane systematic review has evaluated both the prophylactic and treatment options of recurrent corneal erosions . In our clinic, corneal erosion episode is managed with topical antibiotics for few days (usually a week) and intensive lubrication. Despite bandage contact lens has been described as a good treatment for recurrent corneal erosion and Salzmann nodules, studies comparing bandage contact lens with lubricants failed to show long term outcomes . Salzmann nodules usually only require intensive lubrication, but other interventions as alcohol delamination have been previously described with good outcomes . In our only case, patient remained asymptomatic for more than a year and a half. Autologous serum has proven to be an effective treatment for recurrent corneal erosion combined with PTK or alone [7,8]. Furthermore, plasma rich in growth factors (PRGF, Endoret) have shown to be superior to autologous serum in several aspects studied [9-11]. Despite no clinical trials comparing PRGF and other treatment strategies have been designed yet, PRGF is a promising treatment for symptomatic epithelial diseases. In our study, one patient showed resolution of recurrent corneal erosion symptoms after six months. More follow up and larger case series is required to confirm this promising treatment. Ní Mhéalóid Á, Lukasik T, Power W, Murphy CC (2018) Alcohol delamination of the corneal epithelium for recurrent corneal erosion syndrome. Int J Ophthalmol 18: 1129-1131. Dua HS, Lagnado R, Raj D, Singh R, Mantry S, et al. (2006) Alcohol delamination of the corneal epithelium: an alternative in the management of recurrent corneal erosions. Ophthalmology 113: 404-411. Chan E, Jhanji V, Constantinou M, Amiel H, Snibson GR, et al. 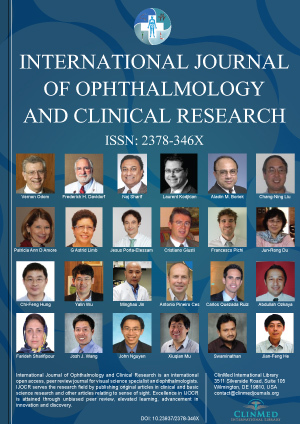 (2014) A randomised controlled trial of alcohol delamination and phototherapeutic keratectomy for the treatment of recurrent corneal erosion syndrome. Br J Ophthalmol 98: 166-171. Diez-Feijóo E, Grau AE, Abusleme EI, Durán JA (2014) Clinical presentation and causes of recurrent corneal erosion syndrome: review of 100 patients. Cornea 33: 571-575. Watson SL, Leung V (2018) Interventions for recurrent corneal erosions. Cochrane Database Syst Rev 9: CD001861. Maharana PK, Sharma N, Das S, Agarwal T, Sen S, et al. (2016) Salzmann's Nodular Degeneration. Ocul Surf 14: 20-30. Del Castillo JM, de la Casa JM, Sardiña RC, Fernández RM, Feijoo JG, et al. (2002) Treatment of recurrent corneal erosions using autologous serum. Cornea 21: 781-783. Holzer MP, Auffarth GU, Specht H, Kruse FE (2005) Combination of transepithelial phototherapeutic keratectomy and autologous serum eyedrops for treatment of recurrent corneal erosions. J Cataract Refract Surg 31: 1603-1606. Sabater Cruz N, Pedro Casaroli-Marano R (2018) Blood derived eye drops for the treatment of ocular surface diseases update. Annals d'Oftalmologia. Etxebarria J, Sanz-Lázaro S, Hernáez-Moya R, Freire V, Durán JA, et al. (2017) Serum from plasma rich in growth factors regenerates rabbit corneas by promoting cell proliferation, migration, differentiation, adhesion and limbal stemness. Acta Ophthalmol 95: e693-e705. Anitua E, de la Fuente M, Muruzabal F, Riestra A, Merayo-Lloves J, et al. (2015) Plasma rich in growth factors (PRGF) eye drops stimulates scarless regeneration compared to autologous serum in the ocular surface stromal fibroblasts. Exp Eye Res 135: 118-126.